Vanna White has nothing on Brooke Martin. She is a poised 14-year-old who pitches a product that is all her own. Brooke is a teenage inventor and she has created iCPooch. 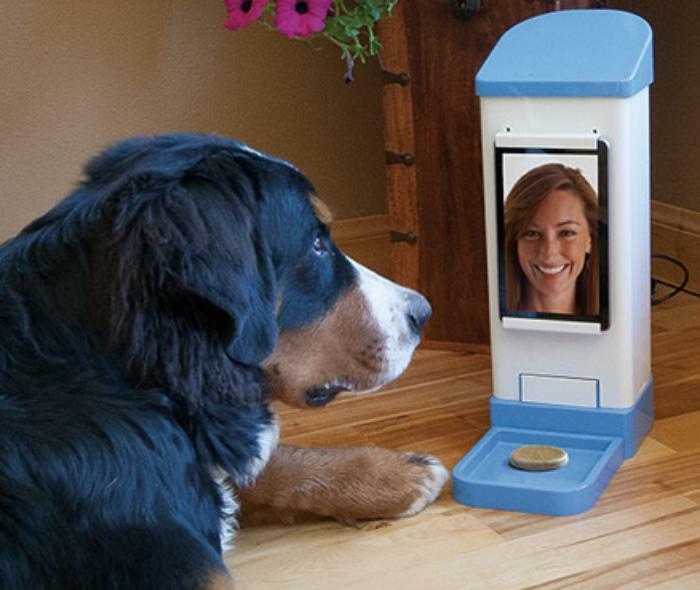 It's a webcam for your dog. The idea of a webcam probably knocks your socks right off in and of itself. Now add a treat dispenser as well, and of course, it's all delivered from an app on your phone. Brooke says her dog had a real separation anxiety problem and got depressed when she and her family would leave for the day. The dog would go crazy running around the house and carrying shoes all over the place. Brooke had an idea. She thought: "I video chat with my friends, why not video chat with my dog? Why not reward my dog with a treat when we do it?" And so the love of a dog gave birth to iCPooch. Here is how it works: The tablet/smartphone operates independently of the iCPooch device, but you control both from the iCPooch Android app, iOS app, or web browser. As long as your smartphone/tablet has a microphone and a camera and is connected to the internet, you can video chat with your dog (or your cat for that matter) at eye level and, with the press of a button, deliver a treat. It actually looks like a big PEZ dispenser. You load the treats the same way -- just stick it in the outer bin and it's ready to go. The device is very lightweight and Brooke said some people are concerned about a large dog knocking it over but she has a remedy to that problem. Just put it high up and let the dispenser release the dog treat on the floor. There is no 5-second rule for dogs. They will obviously be happy to eat whatever wherever. What is also pretty good about this device is that it can be used for your kids, if you aren't home and you want to make sure homework is done. You ask if it's done, they show you and get a little piece of candy. It could also work to dispense medicine for an older person. Brooke, of Spokane, Wash., even has her own line of pet treats to go with the iCPooch.